A "jealous and paranoid" husband who killed his wife with an axe after convincing himself she was having an affair has been found guilty of murder. Nyasha Kahari was found in a car outside a Lidl store in Tile Cross, Birmingham on 30 January. West Midlands Police said she had suffered catastrophic head injuries and was pronounced dead at the scene. 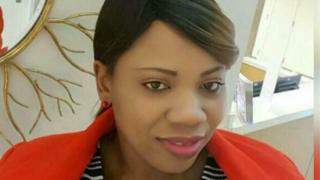 Her husband Norbert Chikerema had denied murder but was convicted at Birmingham Crown Court on Tuesday. The mother-of-four, also known as Gillian, left the family home in Overdale Road, Quinton, with her husband the previous evening on the understanding they were heading out on home visits as part of their care in the community business, police said. When Mrs Kahari, 35, was found in the car park in Mackadown Lane, Chikerema, 42, was found next to her behind the wheel of the Nissan Qashqai. Police say Chikerema had planned to kill his wife that night and a blood-stained axe was found inside the car. The force said Chikerema confessed to killing Mrs Kahari but claimed he was not of sound mind at the time and denied murder. Det Insp Paul Joyce said: "Chikerema's actions mean four children now have to live without their mother; a family has been tragically ripped apart and he will have to live with the consequences of his brutal attack forever. "He suggested he was not of sound mind at the time of the killing and pleaded not guilty on the grounds of diminished responsibility. "However, we demonstrated a degree of advanced planning − notably taking the axe out in the car that night − and the jury quickly found him guilty."